2014 was never supposed to be big or special but there were a few goals. Firstly I wanted to match my 2013 mileage for the year at 6,000. Secondly I wanted to complete the South Downs Way 100. Thirdly I wanted to see if I could go the whole year without using my car to commute to work. We'll see how I got on with these goals later. Having not used my car to drive to work since 3rd May 2013 I planned to see how far I could go into 2014 doing the same. To be fair, the weather in 2014 was pretty mild. There weren't many days with frost and the wind definitely wasn't as bad as I've experienced in the past. The hardest part about trying to ride every day isn't the mindset or the equipment it's planning. Planning what you need and when and how you intend to transport it is the key. Checking the weather regularly helps. Occasionally I needed to get bigger stuff to or from work that I couldn't carry on my bike. This meant planning transporting that stuff on my days off. I completed this goal with ease. I've definitely got past the mental phase of getting out and on to the bike in any weather. However this isn't always the case for leisure riding. 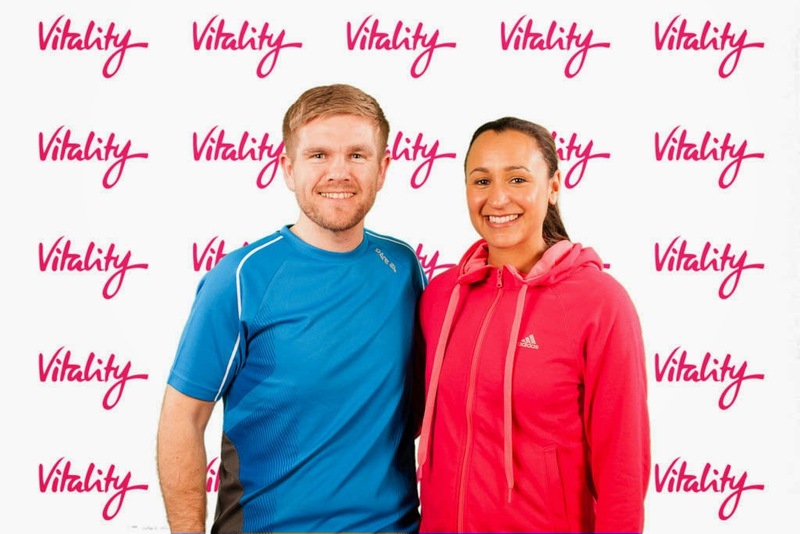 In March I got to train with and meet gold medal winning olympian Jessica Ennis-Hill. I won't go into details here. You can read my report here. Nothing important happened ride wise until April. April was #30DaysofBiking. If you're not familiar with the event, it's basically an excuse to get out on your bike every day in April. It doesn't matter what for or what distance. It just matters that you get on your bike and ride. I'm normally joined by one or both of my kids for this and my youngest son, aged 10, managed to break his record from last year and ride 140 miles. April was also the month I took part in my first G+ community ride. This one was in the New Forest. It was a pretty wet day for cycling but it was great to meet and ride with others from the online cycling group. I also got to meet the legend that is Dave Holmes. Not only did he do the 60 mile ride with us, he rode there from London and back again. A total of 235 miles in 23 hours! 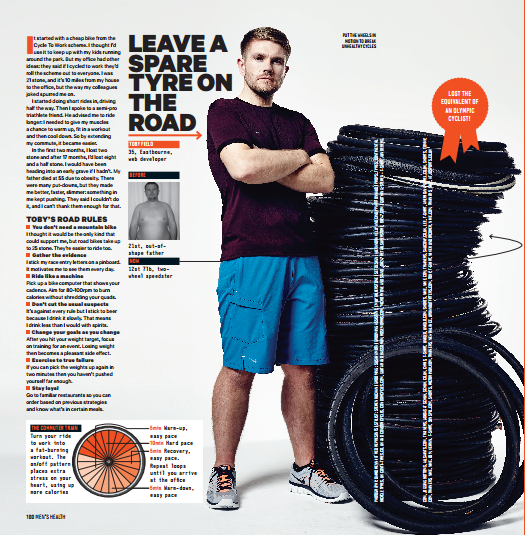 Also in April, I had the pleasure of sharing my story with Mens Health magazine and was featured in their May issue. In June I took part in my 5th BHF London to Brighton Bike Ride. This time I encouraged a couple of people that had never done it before to take part. I also took part in the Eastbourne Cycling Festival sportive. When an event is held in your home town, it's be rude not to! In July I took part in the Dunwich Dynamo. If you're not familiar with it, it's a 120 mile night ride from London to Dunwich in Suffolk. I had the pleasure of riding with the legendary Dave Holmes and Hamish Gaunt. We'd spoken about the event back at the G+ ride in April. Only a couple of weeks before, it was suggested that we try and ride back to London after rather than get the train. I said I was up for giving it a go but made no promises I'd be able to do it. On the night the conditions were great. It was a warm evening with rain ahead of us for almost the whole ride. We never got properly rained on until Dunwich. Having not done any century rides in 2014 and the lack of sleep, I was finding the going tough for the ride back. Because of how long it would take us, Hamish and I decided to split from Dave and head for the train at Ipswich. Having completed a total of 156 miles it became the longest ride I've ever done. I couldn't have done the last bit without the help from Dave and Hamish. Thanks guys. Due to moving house I was unable to take part in the BHF South Downs Way 100. I was a little disappointed but it's on my list for 2015. In September it was time for the Tour of Britain. On 7th I took part in the Harwoods Jaguar Ride Like a Pro event which was held on some of the route that the Tour would cover. It was a hard ride but I got to ride on some very nice roads. The hospitality was top notch too. On 13th, the Tour came to my home town for stage 7. The organisers of the Eastbourne Cycling Festival put on a hill climb the morning of the stage that covered the KOM to Beachy Head. I volunteered as a marshall. The Tour was televised on a big screen for us to watch and being on the route we watched as they raced past at phenomenal speed! For the rest of the year I didn't get much extra curricular rides in due things getting in the way, including the bad weather. However, my final ride of 2014 was on Christmas Eve with my youngest son. We took part in an organised ride along Eastbourne seafront. We were all lit up like Christmas trees. It was pretty cold but we all enjoyed ourselves. Can't wait to do it next year but with more lights on my bike. I definitely had light envy! I completed the year with the highest commuting miles ever, even though my total mileage was just over 750 miles down on last year. 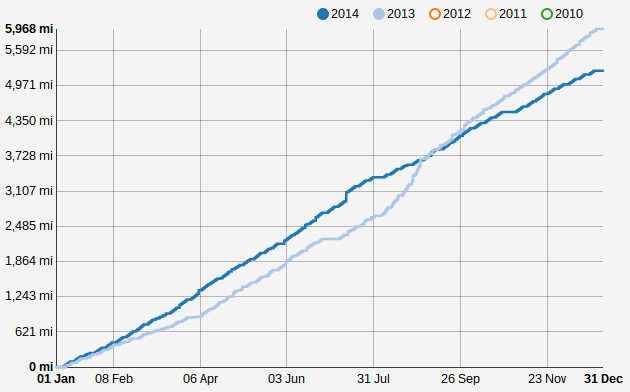 You can see from this graph that I was ahead of last year's millage until the end of August. In 2015 I plan to ride a century a month as inspired by Hamish. Wish me luck.